Discovery of a jet of material launched by a highly magnetic neutron star forces rethinking a longstanding theory about the origin of such jets. Astronomers using the National Science Foundation's Karl G. Jansky Very Large Array (VLA) have discovered a fast-moving jet of material propelled outward from a type of neutron star previously thought incapable of launching such a jet. The discovery, the scientists said, requires them to fundamentally revise their ideas about how such jets originate. Neutron stars are superdense objects, the remnants of massive stars that exploded as supernovas. When in binary pairs with "normal" stars, their powerful gravity can pull material away from their companions. That material forms a disk, called an accretion disk, rotating around the neutron star. Jets of material are propelled at nearly the speed of light, perpendicular to the disk. "We've seen jets coming from all types of neutron stars that are pulling material from their companions, with a single exception. 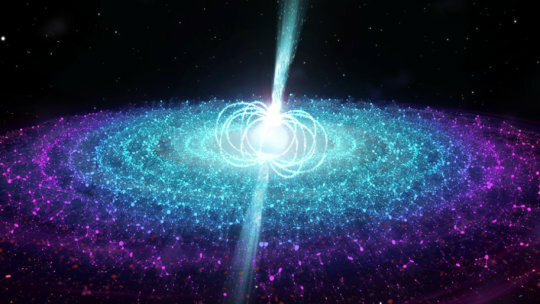 Never before have we seen a jet coming from a neutron star with a very strong magnetic field," said Jakob van den Eijnden of the University of Amsterdam. "That led to a theory that strong magnetic fields prevent jets from forming," he added. The new discovery contradicts that theory. The scientists studied an object called Swift J0243.6+6124 (Sw J0243), discovered on October 3, 2017, by NASA's orbiting Neil Gehrels Swift Observatory, when the object emitted a burst of X-rays. The object is a slowly-spinning neutron star pulling material from a companion star that is likely significantly more massive than the Sun. The VLA observations began a week after the Swift discovery and continued until January 2018. Both the fact that the object's emission at X-ray and radio wavelengths weakened together over time and the characteristics of the radio emission itself convinced the astronomers that they were seeing radio waves produced by a jet. "This combination is what we see in other jet-producing systems. Alternative mechanisms just don't explain it," van den Eijnden said. Common theories for jet formation in systems like Sw J0243 say the jets are launched by magnetic field lines anchored in the inner parts of the accretion disks. In this scenario, if the neutron star has a very strong magnetic field, that field is overpowering and prevents the jet from forming. "Our clear discovery of a jet in Sw J0243 disproves that longstanding idea," van den Eijnden said. Alternatively, the scientists suggest that Sw J0243's jet-launching region of the accretion disk could be much farther out than in other types of systems, where the star's magnetic field is weaker. Another idea, they said, is that the jets may be powered by the neutron star's rotation, instead of being launched by magnetic field lines in the inner accretion disk. "Interestingly, the rotation-powered idea predicts that the jet will be significantly weaker from more slowly rotating neutron stars, which is exactly what we see in Sw J0243," Nathalie Degenaar, also of the University of Amsterdam, said. The new discovery also implies that Sw J0243 may represent a large group of objects whose radio emission has been too weak to detect until new capabilities provided by the VLA's major upgrade, completed in 2012, were available. If more such objects are found, the scientists said, they could test the idea that jets are produced by the neutron star's spin. The astronomers added that a jet from SwJ0243 may mean that another category of objects, called ultra-luminous X-ray pulsars, also highly magnetized, might produce jets.